An attempt to answer the question of Synchronism vs. Asynchronism of Method Rejection which states "A method becomes rejected only when some of the theories, from which it follows, also become rejected." Synchronism of Method Rejection theorem was formulated by Hakob Barseghyan in 2015.1 It is currently accepted by Scientonomy community as the best available theory on the subject. Synchronism of Method Rejection theorem (Barseghyan-2015) is an attempt to answer the following question: When a method is rejected, must it be the case that a theory has also been rejected? 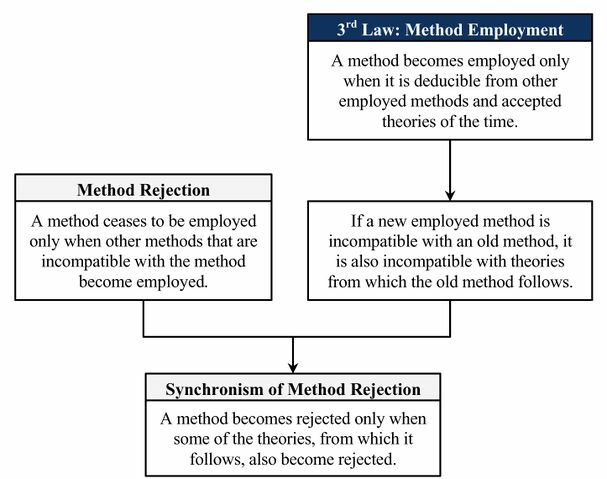 See Synchronism vs. Asynchronism of Method Rejection for more details. This page was last modified on 7 October 2016, at 00:20.